your choice and enjoy live music on a relaxing hour and a half along the scenic canal. April performances include The Henrys, Carey Murdock, and Gwen Hughes. The Mayors&apos; Masters Reception, Rock Fore! Dough, ParTee on the Green, The Major Rager, and the The Grand Ole Rager pack the nights of Masters week with off-course entertainment. Aiken’s most beloved home and garden tour, returns with a lovely collection of six private Winter Colony homes. A musical celebration at the Unitarian Universalist Church of Augusta of art in nature, featuring nationally touring artists/composers alongside local performers. Artists will perform several selections representative of the season. At Sacred Heart Cultural Center, be inspired by lush landscape and floral exhibits, learn from well-known speakers, shop the extensive vendor market, and tour spectacular private gardens. A world of garden discoveries await you! This music-centered event occurs on the third Sunday of each month at The Bee&apos;s Knees. Weird and wonderful sounds on vinyl brought to you by Matt P and featuring special guest dee jays. Based in the late 1700s, the weekend will be filled with new ways to learn and experience the history of Augusta and North Augusta. Historical re-enactors will be at the Living History Park to allow a glimpse of the period of the American Revolution. Combining a daunting array of musical styles to create a signature sound that is not quite maestro, not quite emcee, violinists Will B and Kev Marcus fuse jazz, hip-hop, funk, and classical music. Colton Ballet presents an exciting and inspiring evening of music and dance at the Imperial Theatre. The evening features renowned local musicians Karen Gordon and Garden City Jazz and Augusta’s favorite “Lion King” artist, Russell Joel Brown, onstage with Ailey II dancer, Christopher Wilson, and guest artists Olivia Powell and John Deming. This outdoor event at Holy Trinity Greek Orthodox Church will include authentic Greek food and pastries, live music and dancing, Taverna, Greek shopping bazaar, church tours, and a children&apos;s area. Admission is free! Sarah works for the marketing department at the Augusta CVB. 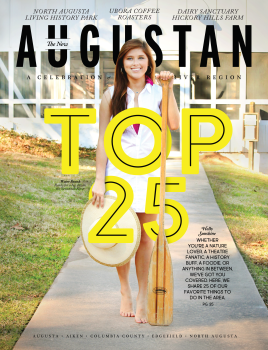 She lives in North Augusta and since moving here in 2004 has fallen in love with Augusta's River Region, especially the areas to explore "below the 20." That's I-20 to you locals!